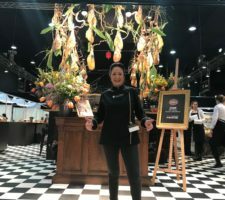 Last week I as a freelance Cortadora Profesional 3 days in the State of JOKA may stand during the fair Tavola 2018 in Kortrijk Expo, Belgium. 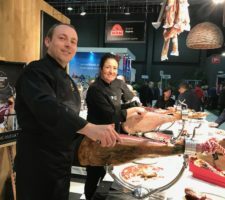 I represented 2 types of ham that I cut for customers and visitors: Jamón de Bellota Iberian ham of Trevélez IGP ( Protected geographical indication) both hams of the Spanish company Antonio Alvarez Jamonez, S. L. from Trevélez, Granada. What a great and delicious hams.! 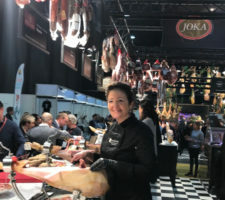 What is a top company JOKA and what a feel them for quality and delicacies! 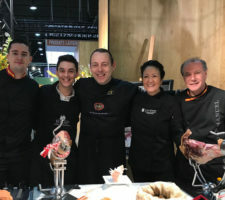 The presentation of the hams on the stand and the deployment of professional cortadores for the hams shows a lot of respect and passion for the product ham. Chapeau!! Along with the professional, friendly and helpful staff, with suppliers and with fellow cortadores from Spain we worked as a team in a good atmosphere. I look back with great pleasure and gratitude on this cooperation.